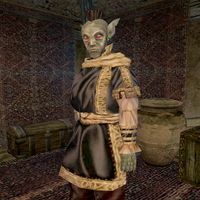 Ralds Oril is a Dunmer trader who owns a shop in Suran, near to Oran Manor. He is not involved in any quests, and does not have any unique dialogue. Items with a % in the Qty column are found growing on plants in the store, which will restock over time, not instantly like other restocking wares. This page was last modified on 24 June 2013, at 23:11.